Marvin takes SILVER in NAGA NoGi BJJ!!! 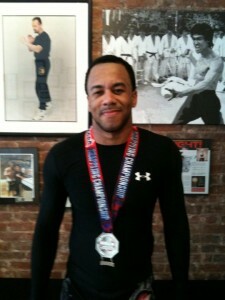 This was Marvin’s second Silver medal at Naga. Marvin submitted his first three opponents to take the Silver Medal. Marvin has only been training Brazilian JiuJitsu for 7 months (he started his training at Anderson’s Martial Arts) we are very proud and honored to have him as a student. This wins proves that you can have a full time job, a family and still train hard enough to win and full fill your goals and dreams.